If it is true, I wonder if Benny and Sweet Mayhem will be the same when they are released? 5000 units per store. Since when has TLG undersupplied anything related to one of their movies? There are no numbered or exclusive parts so would have to be the box? I think they missed 3 zeros of it. I wouldn't believe 1:5000 for a second. It'll be a $1000 set if that was the case and the box-lickers would definitely be out in force! not seeing these in stock at any store using tracker. maybe they are doing a "limited edition" of the separate emmit/ws bhz and then we get a two pack later on sort of like opposite of what happened with rey/kylo ren bhz which had the combo pack and then separate editions? there is a precedent for walmart getting these smaller number limited edition sets - last years anniversary sets were the same way. Online Exclusive so should be no store stock. Think you may be correct on the 2 pack was hoping for a different hair color. My walmart still has the anniversary sets for $25. Oddly just got a .01 refund on my PayPal account regarding this order... Fortunately my order appears to have just shipped. 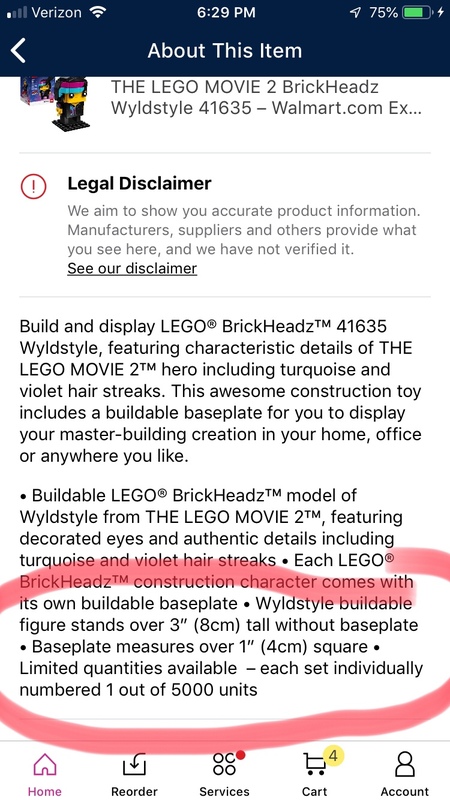 I don't see Benny Brickhead at Walmart - anyone else? Did y'all buy him up already? I was able to submit an order for 2 of each. Should still be there. Regarding the limited Quantities. I would almost bet money they are reusing the page-holder from the 3 Vintage sets that were individually numbered. Didn't they only do 5K each of those? Benny - not Emmet. I see Emmet and Wyldstyle. Did you see spaceman Benny? Nah, sorry, I misread that. I would wager that Target gets the other two, although interesting that WM would get (arguably) the two main characters as exclusives. Benny and Emmet are FAR more popular than Wildstyle. So it makes sense that Target gets Benny and Mayhem. If anyone is ordering from Walmart and trying to get to the free shipping threshold (yeah, I know - you're probably buying at least 2 of each, so not a problem), Walmart has Christmas Train Ride 40262 for $9.30. If there's only 5k production of these and you can order it right now in WM so there is no stock provided for EU and the rest of the world. 5k stock will be sold out in US today. Lego produced more than 5K of these for sure. Although with the movie coming out Friday in the US (and already out abroad) I wonder why they didn't release these sooner. I'm sure many are at prepping for cancellation status. Just got my shipping confirmation from Walmart and says I should have them tomorrow. I'll update if the boxes are indeed stamped/stickered if nobody else has them yet. I am more interested to know how this seller can guarantee 5 of each given how Walmart.com love to cancel orders..
Haven't paid RRP for a set in a long time. In for 2 of each and crossing my fingers. Limited edition of 5000 and specially numbered sounds suspect but worth a shot if it's true. Well, my theory on using the page is wrong, but I am still willing to bet that these aren't limited. The Vintage set was limited to 5K each, however. I do find it interesting that the back of the box doesn't show Benny or Mayhem. Typically (TLBM and Avengers BHz) had all 4 in the "group" on the back. my order of 2 has shipped (to UPS)...according to tracking; so sounds like it has left the warehouse.